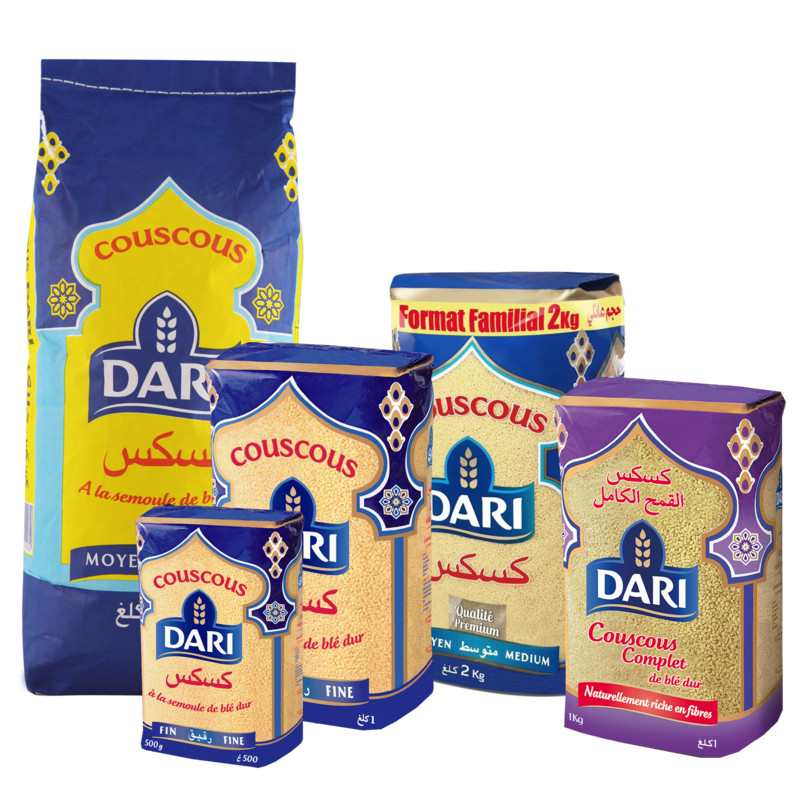 Imported from Morocco, DARI couscous is considered as the best couscous on the market. Mogette beans : are white beans native to the French department of Vendée in the region of Pays de la Loire. Tarbais bean : is a local variety of French beans. It is emblematic of the French region Hautes-Pyrénées. Certified by Le Label Rouge and IGP, its specificity is ensured by rigorous specifications. Large White Kidney Beans : usually used in cassoulet. Madagascar Lima Bean : flat and large bean cultivated in Madagascar. Navy Beans : small and round beans. Cranberry Beans, Borloti, Pintas, Barbunuas : bean produced in America, South Africa and China. Light Red Kidney Beans : related to dark red kidney beans because its skin stays pink while being cooked. It is veined and has a floury-texture. Dark Red Kidney Beans : average size, its color varies from light red to dark red. It has a smooth and pronounced texture. Mostly consumed by Africans and in South America. Black turtled Beans : average size, black and shaped like an oval. It has a sweet savor. It is the most consumed one in America. In Mexico, it is used in meals, soups and salads. Black eyes Beans : beige with black eye. It is lightly smoked. Green flageolet : small and flat, green with a subtle flavor. It is a French specialty. 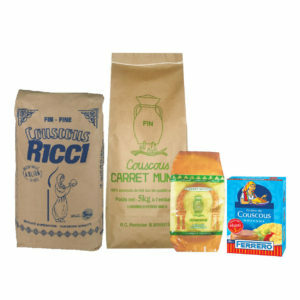 Packaging: 500g, 1kg, 5kg and 10kg. FERRERO couscous. Thin and medium. Packaging : 500g. 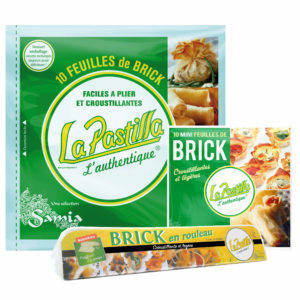 Pastry sheets 10 sheets of 170g : coming from North Africa, pastry sheets are essential to the preparation of traditional pastillas and various recipes. Pastry sheets – roller : 1,5 m roller of light pastry sheets that allows multiple cuts. Barley semolina : widely consumed in North Africa, barley semolina is a substitute to corn semolina and can be used to prepare couscous. Packaging: 1, 5 and 25kg. Roasted and salted pistachios : fruit from the pistachio tree. Consumed as a snack. Rice crackers : from puffed rice, consumed as an appetizer. Roasted and salted sunflower seeds : consumed as snack around the Mediterranean basin. Also excellent in salads, vegetables, cakes and yoghurts. Walnuts half : fruit of the walnut tree, the fruit comes in half after breaking the shell. 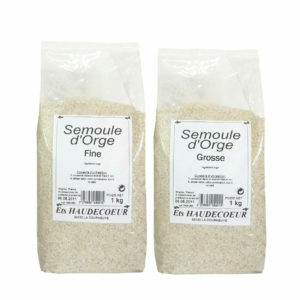 Can be used in making pastries or consumed as snack. 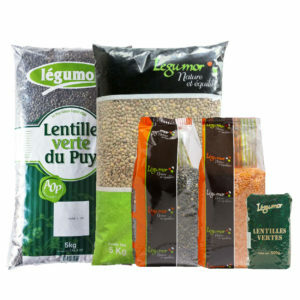 Green lentil : from France and Canada. “Du Puy” Green lentils : variety of lentils cultivated in Haute-Loire in France, and profits of an AOP (protected designation of Origin) since 1996. The first vegetable AOP. Eston or Laird lentils : are the biggest, the lightest and thickest of lentils. Principally used in oriental cuisine. Football lentils : whole and unshelled. Red Split lentils : are husked. Their cooking process is faster than the other varieties. Principally used in Indian or Turkish cuisine. Their flavor is slightly spicy. 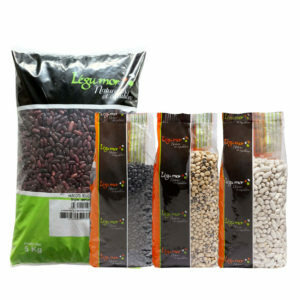 Beluga lentils : naturally black, those small lentils owe their name to the resemblance with caviar beluga once cooked. RICCI couscous. Thin and medium. Packaging : 5kg and 25kg. CARRET MUNOS couscous. Thin and medium. 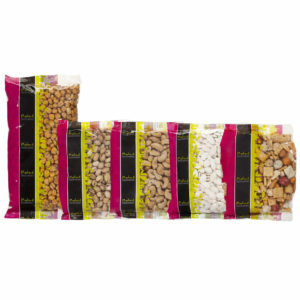 Packaging: 1, 5 and 25kg. 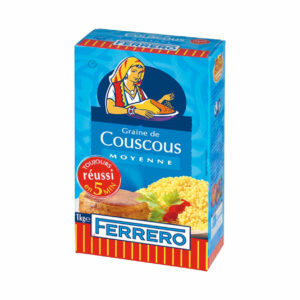 FERRERO couscous. Thin and medium. 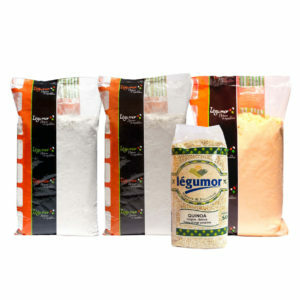 Packaging 500g.